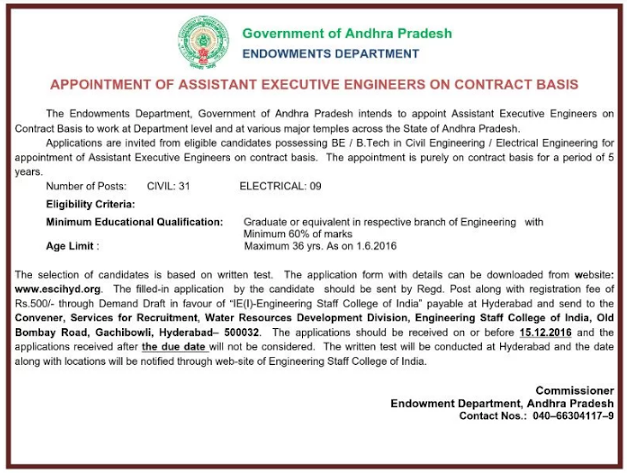 Andhra Pradesh Endowments Department has issued a notice to invites applications against 40 Vacancies of Assistant Executive Engineer Posts.Candidates with the required eligibility criteria are invited hereby for filling and submitting the application form through offline mode for the current openings on or before the closing date (15th December 2016). Essential Qualification Required: Job applicants, who are applying for above said posts must have completed Engineering Degree (Civil / Electrical Engineering) from a recognized Board / University / Institute. Examination Fee for All Candidates : Rs. 500/-. Appliers’s maximum age limits should not be above 36 Years As On 01-06-2016. The selection of contestants who are participating under Andhra Pradesh Endowments Department Recruitment 2016 shall be through the Written Exam. 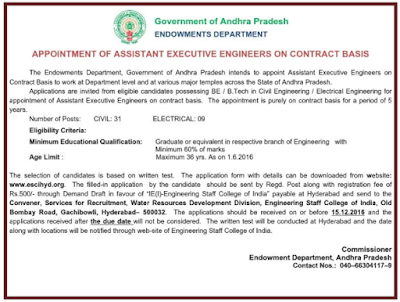 How to Apply for Andhra Pradesh Endowments Department Recruitment 2016? Eligible contestants who fulfill the all term and conditions of eligibility must read all the instructions and information given on the notification cautiously and download the application format from official website of organization i.e. www.escihyd.org. Closing Date for Receiving Hard Copy of Application Form Is : 15-12-2016.